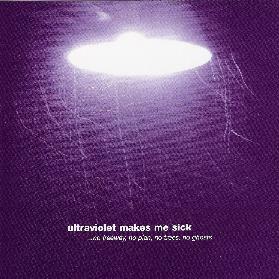 Ultraviolet Makes Me Sick - "...No Freeway No Plan No Trees No Ghosts"
Ultraviolet Makes Me Sick is the Italian trio of Alberto Anadone on guitar & bass, Gianmaria Aprile on guitars and Davide Impellizzeri on drums & vibraphone. The trio play a slow, dreamy and creatively constructed brand of psychedelic-ambient-jazz-progressive rock. Don't let the progressive rock tag throw you. There's no hot chops or stunning instrumental prowess here. What the band excel at is thoughtful and creatively constructed music that explores, experiments, evolves and ultimately captivates. There's the beautiful aggression of "Counter-Clockwise", that leads the listener through a lazy psychedelic dreamland. The dual guitars alternate between simple but luscious melody lines and harsh but enticing walls of noise. "Overexposed" is similar in its use of simplistic melodic patterns that by way of their tonal and atmospheric exploration, invention, and Impellizzeri's drumming, manage to induce contemplation and touch the soul. I love the sound of the fretless bass. With the right touch, single winding notes can speak volumes. And on "Intimacy Is Jazz, Disturbance Is Art", combined with the guitar and varied, thoughtful and controlled drumming, makes for a short but very interesting jazz/art-rock piece that I would have loved to hear continue on for a few more minutes. "A Two-Headed Coin" and the title track are similarly varied and ever evolving, straddling the lines between avant-progressive rock, psychedelia and jazz. "I Think I Feel The Night Comin' On" is another song that demonstrates the musicians' interesting incorporation of jazz elements into a kind of atmospheric psych-prog realm. In summary, I'm re-reading my writeup and Ultraviolet Makes Me Sick is a real challenge to describe. Definitely off the beaten path but creative in their approach and with a flair for hypnotic music that demands the listeners attention. For more information you can visit the Ultraviolet Makes Me Sleepy web site at: http://www.uvmms.com.